Charity Christmas catalogs are here and many want you to give an animal for a needy family. World Vision and Gospel for Asia are two catalogs which arrived recently. I wouldn’t give a nickel to GFA but if I gave to national charities, I would consider World Vision (with this caution – almost all of my donating is local). Since the Christmas giving season is underway, I thought a little review from two years ago might be helpful. Here I reprint a post about animal giving to World Vision from 2014. 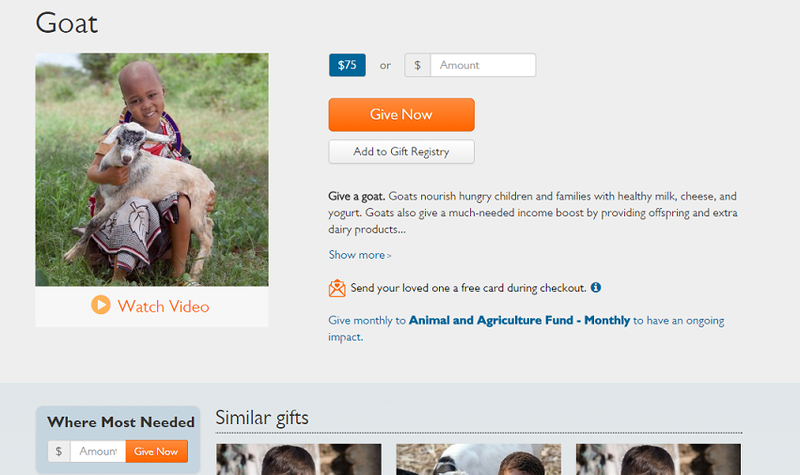 When you donate money to buy a goat from the World Vision catalog, who gets that goat? Answer in the comments section; base your answer on the screen capture of this online page from the World Vision website. If you provide any more information about this appeal, please provide your source. When people purchase a goat from the World Vision gift catalog, their donation goes into a pool of money designated to purchase livestock and related agricultural projects, including goats. Those animals are then distributed to families participating in World Vision animal husbandry programs in a variety of countries around the world. We use the slightly broader categories because it’s nearly impossible to encourage the exact number of donations to match the exact need for specific animals in our programs, but it’s still critical that we honor our donors’ intentions with their gifts. The “related agricultural projects” I mentioned above are efforts that help families care for the animals they’ve been given. Providing watering sources, farming assistance, famine relief and other essentials help families truly benefit from their livestock. If people want to give to a general fund, the World Vision catalog has an item called “Where Most Needed.” These donations are placed into programs – in any country and within any sector of World Vision’s work – that are partially funded and need more resources to be fully operational. I appreciate this answer. The one on the website is less clear than this. We promise to honor your generosity and use your donation in the most effective way possible. The needs shown in this catalog reflect World Vision projects at the time of writing and the suggested donation amounts are based on periodic surveys of the countries we serve. Each item is representative of the gift category in which it appears and donations will be used to provide assistance where it is needed most within that category or to address a similar need. The multiplying effect from grants and donated goods may change throughout the year on identical or similar offers due to variations in the start and end dates of donor grants and our programs. Givewell.org calls an approach like this a donor illusion. Although I might not go that far, I can understand how some could be disillusioned when they thought they were buying an animal for a family. Many people I have spoken with believe that is what the promotion promises and that the fine print should be a bigger part of the promotion. I am not saying the money goes into questionable places. I believe it is necessary to support the efforts with education and training. I do wonder how many animals are requested versus how many are purchased. And I wonder how much the Christmas push to purchase an animal raises as compared to how much is spent to purchase animals. However, I do know that some people get animals and that much of the money does go into assisting needy people. So if you thought you were buying an animal for a needy child/family, now you know some of the rest of the story. Recently, several big name Christian leaders have made a case that a vote for a third party/independent candidate is a waste of a Christian’s vote and will only serve to elect Hillary Clinton. Dire warnings and shaming accompany these appeals. No one owns or is entitled to my vote and support. If the GOP and Democrat parties put up unqualified and unfit candidates, I am not obligated to support one of them. In this instance, for different reasons, I believe Clinton and Trump are equally unacceptable. There is no biblical mandate to support one party or another in a two party system. 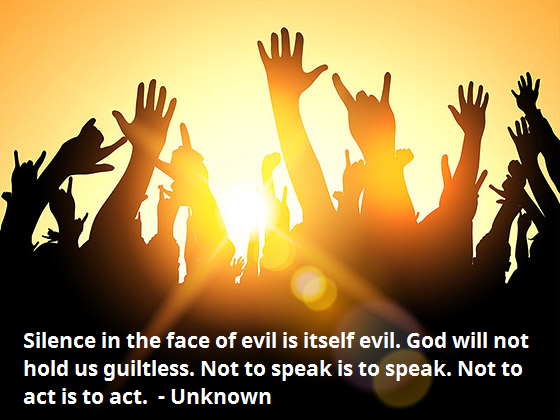 The two party system is not divinely inspired. A viable third or even fourth major party would be a benefit to the nation and allow representation for important viewpoints now stifled by the two-party system. At some point, an independent party must gain votes from citizens to gain viability. An independent movement will not grow unless citizens cast a ballot for independent candidates running for office. This election featuring two of the most unpopular candidates in history is a good opportunity for citizens to exercise their right to declare a pox on both houses. From the perspective of someone who doesn’t support either Clinton or Trump, now is the time to declare independence from the two-party stranglehold on what is possible. I don’t believe a sufficient case has been made by evangelical Trump supporters that Clinton will destroy the country. While I think the Republic will survive Trump, I think his weaknesses may actually be more dangerous to our safety than Clinton’s. Having said that, I believe both candidates bring unacceptable qualities to the table. My position has nothing to do with “moral preening” or “fig leaves” or some other self-righteous way to dismiss reasoning which results in support for an independent candidate. From my point of view, voting third party/independent is the long run option. We must start somewhere and now seems like as good a time as any. In any case, no advocate for holding one’s nose and voting for Trump has been able to provide a biblical basis for staying with the status quo. That is because there isn’t such a basis. The Bible doesn’t address a republic such as ours and only endorses the selection of moral and upright people as rulers. If anything, the Bible promotes the selection of upright people for leadership. Other than independent candidates, there is no real option to exercise that value this year. Some (e.g., Wayne Grudem, Eric Metaxas) have suggested that pragmatic voting is how we should proceed. They believe God (and in Metaxas’ case Bonhoeffer) would get behind Trump because the consequences will be better in a Trump administration. This position requires an omniscience which no human possesses. No one knows what the consequences of each selection will be and it is presumptuous to assert that one does know. Since these pragmatists don’t have a direct line to God, we cannot accept their warnings and guilt trips as inspired revelation. If you think Donald Trump has made a good case for himself, vote for him. If you think Hillary Clinton has made a good case for herself, vote for her. However, if you believe neither candidate is acceptable, then find someone you support and vote for that person with thanksgiving that you have the right to do so. *Full disclosure – I favor independent candidate Evan McMullin. This tweet from Kellyanne Conway is highly irresponsible and may serve to gum up the works at polls around the country. Here is what she tweeted (by the way Eric Metaxas retweeted this – see below). Trump partisans on social media are going absolutely insane over the report of one woman in TX who said her vote for the Republican ticket was changed to a vote for Clinton. With the Trump campaign fueling the fire, Trump fans are insisting on paper ballots because now they are whipping up distrust of voting machines (allegedly linked to George Soros). According an Amarillo news report, there has been only one report of an irregularity — the woman who reported it on Facebook. Election officials at the polling location in Randall County — most of whom are Republican — report that the machine test out fine and votes aren’t being changed. Randall County Elections Administrator Shannon Lackey said what likely happened was that the machines allow for crossover votes, where a voter can select a straight-ticket ballot, but are still permitted to change their vote in individual elections for candidates of other parties. Lackey went on to say that this is the sixth election that the machines have been used in Randall County. Huntley confirmed Tuesday there no issues with equipment on the first day of early voting. I can imagine now that worried Trump voters will demand paper ballots or take longer to vote, thus lengthening wait times at the polls. At the least, now the more conspiracy minded of the Trump clan will have yet another campaign-endorsed reason to question a Trump defeat. Calling the election results into question without evidence is staggeringly irresponsible and I call on Trump supporters among my evangelical tribe to stop it. Please check things out before you pass along misinformation. Fox News is linking the interest in this story to machines allegedly owned by a George Soros owned company. According to this Business Insider report, the voting machine maker isn’t owned by Soros and they won’t be used in this year’s election (check out Smartmatic’s website on these topics). Avoid #SmartMatic voting machines owned by #GeorgeSoros. Demand a paper ballot. Make an extraneous mark on it and photograph it for records. Two articles are out today (Atlantic and Politico Magazine) featuring the petition launched at Liberty University to protest Jerry Falwell, Jr’s vocal support for Donald Trump. I posted that letter when it came out. The student protest doesn’t represent a majority of LU students it seems, but their bravery is having an impact. Politico Magazine’s article seems more pointedly focused on the anxiety felt by Liberty faculty about speaking on the record. No Liberty faculty would go on the record for either publication. Brandon Ambrosino, writing for Politico featured many comments from faculty about their job concerns if they spoke their mind. Ambrosino also highlighted the case of Mark DeMoss who was asked to step down from a committee of the Liberty board of directors over his critical comments about Falwell’s Trump endorsement made in the Washington Post. DeMoss later resigned altogether from the board. Ambrosino cited my blog post on that event. The Atlantic article by Emma Green provides an in depth look at the student body at Liberty. She described the protest effort but also interviewed students who support Trump. Although stated differently than Ambrosino, I think both articles paint a picture that those faculty opposed to Trump or who speak in favor of center-left positions on various matters are right to fear for their jobs. I don’t say that due to the absence of tenure or the fact that all employees serve at the pleasure of the administration. It is also the behavior of the president and board of directors that matters. If Mark DeMoss can be marginalized at Liberty over an expression of his viewpoint, then who is safe? As the Donald Trump saga nears the end, it will be good to reflect on what can be learned. One thing I hope for is a backlash against false or misleading information being used by evangelicals to make their political points. Of course, this kind of thing has been going on for years. However, after so many people have been repeatedly misled by so called thought leaders, I hope more evangelicals wake up to the need for simple fact checking. On this story, Michelle Goldberg contacted the source. So I called him. Masada told me that on Nov. 11, he got a call from a man named John—he doesn’t remember the last name—who sounded “distinguished, like an attorney.” John said he represented the Clinton campaign. He asked Masada “who had put him up” to posting the video. In a menacing voice, he told Masada, “This is not good for your business.” John then asked for the email or phone numbers of the five comedians who were featured in the video. “I told him, ‘Eff you,’ and I hung up,” says Masada. That’s it. That’s all I could find to support the story. Even if this “John” had some connection to the Clinton campaign, it doesn’t mean Mrs. Clinton put him up to it. In any case, this hearsay is not sufficient evidence to go with a news report or even an advocacy piece (as Judicial Watch did). Metaxas should be ashamed to spread around unsubstantiated reports in this manner and then indict the media over it. We do have a free press and Michelle Goldberg did her job. Apparently, Metaxas didn’t check it out or only believes those who report what he already believes. To be taken seriously, evangelical leaders must become more skeptical and better fact checkers. Update: Let’s not forget that Donald Trump doesn’t appear to have a sense of humor. A week ago at National Review Online, Victor Davis Hanson made a case that conservatives should vote for Donald Trump. Hanson is clearly my better when it comes to scholarship, but I wasn’t convinced by his essay. Provoked by his article, I have some questions for anyone who wants to defend the case for Trump with Hanson’s essay. Why does Hanson minimize Donald Trump’s statements on the Access Hollywood audio? Instead of saying Trump described sexual assault, Hanson said Trump “crudely talked about women” and displayed “crude sexual braggadocio.” All words. Not nice words, but words. However, eleven women have now come forward to say Trump did to them exactly what he claimed he did. Trump denies any bad action but given the actions specifically described on the audio, I have to wonder why Hanson didn’t mention this. Hanson marshals Bill Clinton’s moral failings to suggest Trump should not be disqualified due to his moral failings. If I disqualified Trump solely based on his moral flaws then this might have some weight. However, as crude as Trump is, I feel he is disqualified for additional reasons. Why does Hanson fail to fully describe how Trump is expanding the GOP via friendly overtures to white supremacists? Although these groups are a part of Trump’s fans, Hanson doesn’t include the white supremacists in Trump’s coalition. When it was discovered that then presidential hopeful Rand Paul hired a member of the League of the South for his campaign, the scandal was clear and the staffer was fired. When lowly Michael Peroutka sought a county commissioner’s seat, he had to drop out the League of the South to save his campaign. Now, the Trump campaign can invite white nationalists to campaign events and the Republican National Convention with nary a scratch. Trump has made the alt-right mainstream and this doesn’t even merit a mention in Hanson’s case for Trump, save for one reference to Trump being “insensitive” to minorities. Why does Hanson fail to account for William Buckley’s prior writing on Trump? In other ages, one paid court to the king. Now we pay court to the people. In the final analysis, just as the king might look down with terminal disdain upon a courtier whose hypocrisy repelled him, so we have no substitute for relying on the voter to exercise a quiet veto when it becomes more necessary to discourage cynical demagogy, than to advance free health for the kids. That can come later, in another venue; the resistance to a corrupting demagogy should take first priority. I intend to use my quiet veto in keeping with Buckley’s advice. How can Hanson be sure that Trump will bring to power competent conservatives who will actually have influence? Hanson seems to think we can divorce a vote for Trump from the hypothesized benefit a Trump administration will bring. The issue, then, at this late date is not necessarily Trump per se, but the fact that he will bring into power far more conservatives than would Hillary Clinton. No one has made a successful argument to challenge that reality. While I must concede that Trump might appoint a few good people, I don’t believe this possibility offsets the harm to conservative principles already done and potential additional harm of a Trump administration to those principles and to the nation. Why is Hanson willing to declare Trump and Clinton equally corrupt without seeing Trump’s tax returns? Hanson correctly lists Hillary’s offenses and implies they are worse than Trump’s. However, Hanson doesn’t address the fact that Trump has not released his tax returns nor does he call for it. Say what you want about the Clintons, one can trace their money more easily than one can do the same with Trump’s. It is incredible that Trump will complete his campaign without the release of his returns. The fact is Hanson doesn’t know as much about Trump as he does Clinton and he is fine with that. Why is Hanson willing to give Trump a pass on his private sector failings and his contradictory policy declarations? We worry about what Citizen Trump did in the past in the private sector and fret more over what he might do as commander-in-chief. But these legitimate anxieties remain in the subjunctive mood; they are not facts in the indicative gleaned from Clinton’s long public record. As voters, we can only compare the respective Clinton and Trump published agendas on illegal immigration, taxes, regulation, defense spending, the Affordable Care Act, abortion, and other social issues to conclude that Trump’s platform is the far more conservative — and a rebuke of the last eight years. This is perhaps the most perplexing portion of this case. If we cannot use Trump’s past to guide us, then what can we use? The platform? Trump’s statements? If so, which statements? The one where he said we should criminalize a woman for an abortion or the one where he said we shouldn’t? Should we believe, against all common sense and that nation’s stated policy, that Mexico will pay for the wall? Should we believe Trump when he said a single payer plan is a good idea or when he declares Obamacare is a disaster? Why does Hanson talk Trump foreign policy risk without mentioning Russia? It certainly appears that Trump has a thing for Putin. He seems to think Russia is helping with ISIS. Trump’s attitude toward Russia is troubling and worth at least some mention from someone trying to make a case that Trump is less dangerous than Clinton. I would want to have this be front and center in any case for Trump. In fact, there was a significant difference between Trump and Clinton on Russia during the last debate. To me, Clinton seems to have the better read of what Russia is up to and I don’t think the U.S. should trust Russia in Syria or the Ukraine. By the time I get to this question, it seems to me that one must minimize a lot of very important values to get to the case for Trump. Supporters of Donald Trump warn that Hillary Clinton will weaken the Second Amendment. Perhaps they should worry first about the First Amendment. Read this campaign press release from Trump senior economic advisor Peter Navarro. “Over a hundred years ago, a pro-business Teddy Roosevelt busted up more than 40 oil, railroad, steel and other “trusts” that were wielding their rapacious monopoly power to gouge consumers and interfere with the efficient functioning of the American economy. Donald Trump will break up the new media conglomerate oligopolies that have gained enormous control over our information, intrude into our personal lives, and in this election, are attempting to unduly influence America’s political process. “The very corporations that have gained from shipping America’s factories and jobs offshore are the very same media conglomerates now pushing Hillary Clinton’s agenda. She is the official candidate of the multinational ruling elite. “NBC, and its Clinton megaphone MSNBC, were once owned by General Electric, a leader in offshoring factories to China. Now NBC has been bought by Comcast, which is specifically targeting the Chinese market – even as Comcast’s anchors and reporters at MSNBC engage in their Never Trump tactics. “AT&T, the original and abusive “Ma Bell” telephone monopoly, is now trying to buy Time Warner and thus the wildly anti-Trump CNN. Donald Trump would never approve such a deal because it concentrates too much power in the hands of the too and powerful few. “The New York Times strings are being pulled by Mexico’s Carlos Slim, a billionaire who benefits from NAFTA and supports Hillary Clinton’s open border policies. Amazon, which controls the Washington Post, profits from the flow of illegally subsidized foreign products through its distribution channels. Lower costs mean higher margins — no matter if bad trade deals lead to massive unemployment in America. Even though Navarro has a PhD from Harvard, this press release has the smell of globalist conspiracy to it. It seems to me that a free flow of information already exists and with the advent of blogging and alternative news sources, the big news organizations have lots of competition. Navarro’s claim that CNN is “wildly anti-Trump” is just stupid. CNN has consistently and infuriatingly featured Trump surrogates or partisans in their news reporting from day one. More than once, I have switched the channel due to the blatant lies told by Trump spokespeople which go inadequately challenged. Threatening to intervene in the nation’s free press is just one more illustration that Trump isn’t the friend of the Constitution his supporters claim him to be. A little over three weeks ago, a group called Scholars and Writers for America made a statement in favor of the candidacy of Donald Trump. Currently 156 Trump supporters have signed. We are writers, academics, critics, historians, and authors who have voted for Republican presidents and candidates. Given our choices in the presidential election, we believe that Donald Trump is the candidate most dangerous to our nation’s founding ideals. He is a unique and dire threat to the political principles, liberties, and cultural values of justice, fairness, honesty, and decency we have long defended. We urge you to vote, as we will, for someone else. I am a signer and encourage others to consider doing so. On point, recently a group of originalist Constitutional scholars confronted the belief among some conservatives that Trump would be the better candidate to uphold the Constitution. 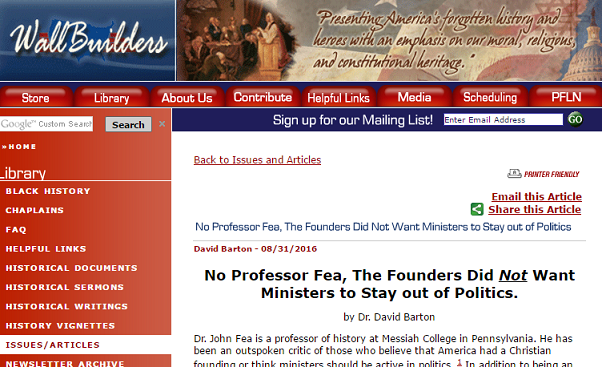 Even though David Barton has gone quiet about his claim to have an earned doctorate, his Wallbuilders Facebook page still refers readers to his work under the byline Dr. David Barton. On the newly revamped Wallbuilders Live bio of Barton, reference to his BA at Oral Roberts University has been removed. On September 7, Barton claimed in a video posted on his Facebook and You Tube accounts that he had an earned doctorate. However, the next day Barton removed the video and Facebook post without explanation. While Barton did not mention Life Christian University as the source of the degree on the original video, it appeared to be a LCU diploma. Later, LCU president Douglas Wingate confirmed that Barton’s doctorate came from LCU. LCU awards what president Wingate calls earned degrees to famous Christians who never attend or graduate from the school. Wingate examines their written works and other materials to award a doctorate based on life experience. Despite the face that awarding a degree solely based on life experience is one of the marks of a diploma mill, Wingate defiantly defends the practice. Other LCU “distinguished degree holders” who did not attend or graduate from LCU include Joyce Meyer, Benny Hinn, and Kenneth Copeland. Meyer prominently touts her “earned PhD in theology” on her website.